Microsoft stunned the world on Tuesday by launching its first ever laptop, the Microsoft Surface Book. Over the past few years, Microsoft (MSFT) has said that its Surface tablets would replace traditional laptops, but now the company has a backup product -- just in case. 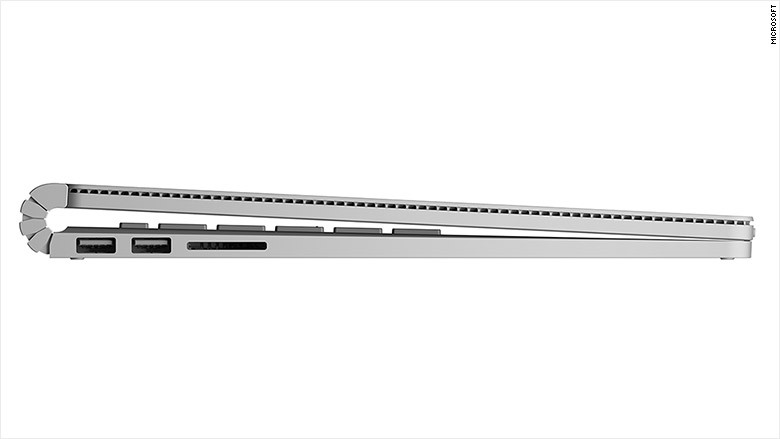 "Some people prefer this form factor," Ed Giaimo, a senior lead on the Surface Book team, told CNNMoney at an event in New York. The Microsoft Surface Book looks like a MacBook at first glance, but how it works is much more interesting -- and intuitive. 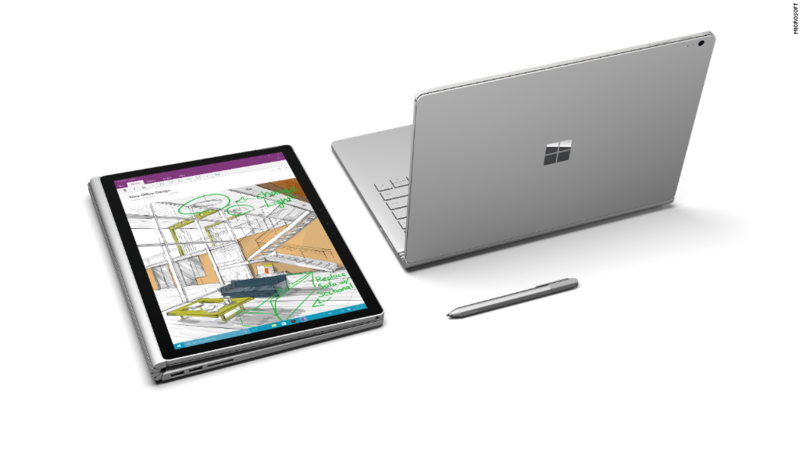 Just like the Surface, the new Surface Book can be used as a full-powered laptop or as a tablet. You can also snap the display screen to the back of the keyboard so it acts like a clipboard, thanks to a unique mechanical hinge. The Microsoft Surface Book has a special hinge that allows the screen to be undocked, or connected backwards as a clipboard. But the Surface Book isn't just another Surface tablet with a better keyboard. The keyboard base enhances the laptop's performance. The Surface Book is noticeably sturdy. The tablet portion of the laptop weighs 1.6 pounds, and the whole unit weighs about 3.5 pounds. 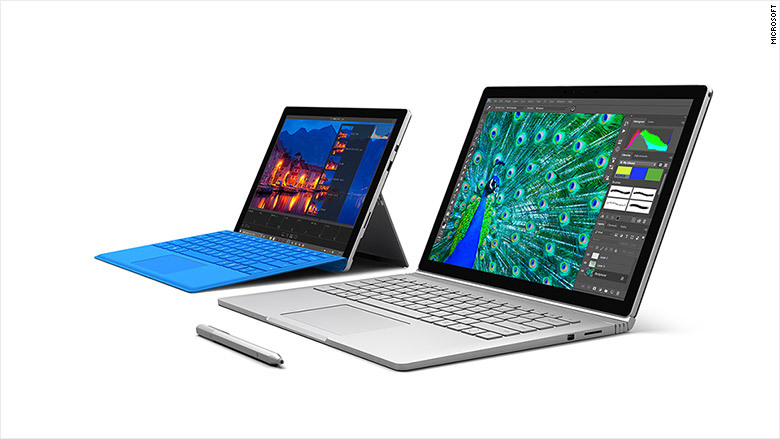 The 13.5-inch Surface Book will go on sale on October 26, with pre-orders starting Tuesday. A base model will cost $1,499. The new Microsoft Surface Pro 4 and Surface Book, side by side. 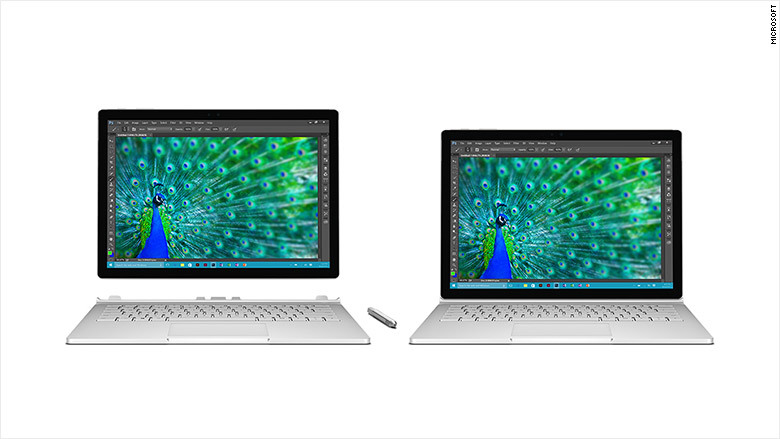 The Surface Book was just one of several Windows 10 products announced on Tuesday. Microsoft also launched a new Surface Pro and two Lumia smartphones. The new Microsoft Surface Pro 4 has a bigger display -- 12.3 inches -- but is the same size as the Surface Pro 3. Microsoft also updated the accompanying keyboard to include a fingerprint reader, larger touchpad and a better keyboard. The stylus also got an upgrade: It has a one-year battery life, magnetically attaches to the Pro 4 (and Surface Book), works with different pen tips and has a digital eraser on the other end. 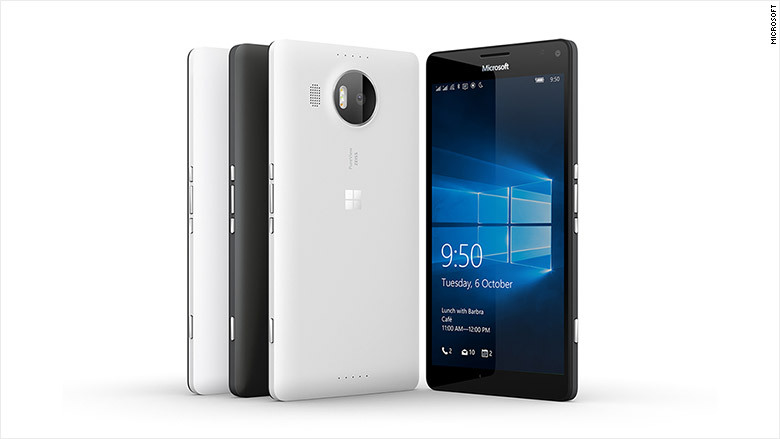 The new Lumia 950 XL runs Windows 10. The Lumia 950 and 950XL are basically like pocket-sized Windows 10 computers now: You can connect your phone to a monitor, keyboard and mouse. Microsoft's goal is to "reinvent" products and "move people from needing Windows, to choosing Windows, to loving Windows," said Microsoft CEO Satya Nadella.